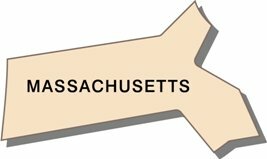 Our facts about Massachusetts are meant to make you think of some of the strange laws of times gone past and hopefully give your family a laugh at the same time, nothing too serious. There are plenty of facts about Massachusetts that can prove to be very informative when you are getting ready to head on through this state. While some people will devote their entire attention to the Boston Red Socks or Salem Witch Trials, there is quite a bit more to this state. Use our state facts pages to quickly find facts on all other US states when you want a quick reference to the population or something like what is a particular state's nickname, they are all collected in a similar format so are easy to locate. These Massachusetts facts are filled with information you can use, like the fact that the first subway system was introduced here in 1897. It is also the home of the Town of Franklin which was the first location to celebrate the name of Benjamin Franklin. Chances are, you didnt know either of these items and there are still plenty of facts about Massachusetts you need to discover. While everyone wants to be recognized as being the first, in Massachusetts only Agawam can claim that honor with a zip code of 01001. Rockport has a unique home that is crafted entirely from newspaper. Not only would one wonder where they go all these newspapers from, but if theres anything from the first Thanksgiving that was held there back in 1621. Not shocking is the fact that the official dessert of Massachusetts is Boston cream pie. What is shocking is the fact that this is also the birthplace of Americas favorite donut, the Dunkin Donut. Not a fan of pie and donuts, and think that cookies are where the money is? Well, one of the facts about Massachusetts is that the Fig Newton is named for Newton, Massachusetts. Another one of the Massachusetts facts you should know is that Elias Howe who invented the sewing machine, did so in Boston back in 1845. While some laws make perfect sense, other acts we all do may be illegal in Massachusetts. Lock down your doors and check out these off the wall laws. If you are at a shooting range, no target can resemble a human being in any way. That might be because all the men are required to carry their rifle to church on Sunday. While you are here, you will want to be sure that you close and lock all your bedroom windows before bedtime as well. It is illegal to snore if this isnt done. If you arent sure if you snore, check with your spouse. Quakers and witches are both banned from the state as well. Dont worry about your oatmeal though; there are plenty of off brands you can still choose from. By the way the Salem Witch Trials were held here in 1692/93. Although it is a very old law, you will need to pay a fee to sport your goatee in public. It turns out Massachusetts is known for more than its great seafood. It is known for creating celebrities, Presidents and sporting stars! Is there something in the water? Enjoy!